Extracellular membrane vesicles (EVs) are a class of biological objects found in all body fluids, which are considered to reflect the physio-pathological state of cells and tissues. Their potential biomedical applications make EVs the subject of intense research. However, their small size –most of them range from 50 to 500 nm- makes their characterization, principally their enumeration, very difficult. In their first paper on this subject (J Thromb Haemost. 2014 May;12(5):614-27), Alain Brisson's group provided a comprehensive description of EVs from blood plasma of healthy donors, by combining cryo-Electron Microscopy (EM) with immuno-gold labeling. 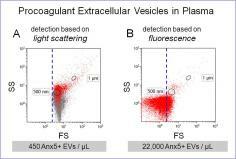 In addition, by comparing the results from EM with those from flow cytometry (FCM), the gold standard method of EVs analysis, the authors found that FCM detected only about 1% of the total amount of EVs detected by EM. The same research group has now developed an alternative approach to FCM, which allows detecting 50 x more EVs than conventional FCM. In the conventional FCM approach, objects are detected on the basis of their light scattering intensity. As EVs are small objects with low refractive index, their scattering intensity is so weak that most EVs are confounded with the flow cytometer background noise and are not detected. The alternative FCM approach applied in this study consists in using fluorescence to trigger the detection of objects instead of light scattering. In this proof-of-principle paper, the CBMN group applied this strategy to the detection of EVs that expose phosphatidylserine -a procoagulant lipid-, using fluorescently-labeled Annexin-5 as a specific marker. This approach allowed to detect as many EVs as EM, confirming previous results. This approach is simple, fast, reliable, applicable on almost every flow cytometer. Scientists foresee that the fluorescence triggering approach will have a major contribution in the EV field. Forward scatter (FS) vs Side scatter (SS) graphs of the same plasma sample. (A), 450 Anx5-positive EVs are detected on the basis of their light scatter intensity, while 22,000 Anx5-positive EVs, about 50 x more, are detected on the basis of their fluorescence intensity (B).